With the SysAid 6.0 General Release behind us, now begins the task of taking stock and gathering together the latest additions to our SysAid toolkit. The next step in the process, of course, is learning how to apply these new tools. With a record 1052 installations in the first 48 hours of the General Release, no doubt, there are more than a few SysAiders at this stage in the road. For those of us back in reality, the learning process is anything but instantaneous, full of dedicated, methodical application, multiple deviations and at times pure trial and error along the way. But the main thing is, as they say, to keep trying. Step by step, we are continually rewarded with progress along the way. Here at SysAid, we believe there's nothing like a strong help and support structure to accelerate the learning process from start to finish, and beyond. That's why we recently launched a new series of Introduction to SysAid 6.0 Webinars, to guide and enhance your SysAid learning experience, and help you navigate your way through your day-to-day IT challenges. The second of the series held last month, Introduction to SysAid 6.0 ITIL, was designed to illuminate the application of ITIL best practices in your IT environment, and opened to hundreds of participants worldwide on the day. We encourage you to share in the knowledge, by accessing our free online webinar highlights. Good luck also to our 38 SysAiders who have embarked on the road to SysAid expertise in our fourth SysAid Certification course, which started yesterday. Our next SysAid Certification Program is due to commence on September 10th, 2009. Find out more here. Don't forget, as you come to unwrap your new SysAid 6.0 features, you're not alone on the path to learning. In the absence of that Matrix-style program, our experienced SysAid Support team is always available to offer a helping hand. May you learn many new and exciting things this month. What do cosmetics, cricket and SysAid have in common? Find out in our exclusive interview with loyal SysAider of the month Yash Upadhyay, who reports that SysAid has the L'Oréal IT pitch well covered, with increased efficiency, cost savings and an enhanced all-round reputation. Q. How long have you been in IT and L'Oréal? A. 10 years in total and 2.4 years in my current position. Q. What do you like best about being in IT? A. I love challenges and new technologies. I especially love trying new things, because I find I learn a lot in the process. Q. And what's the hardest thing about working in IT? A. I don't believe that anything is hard in IT. It's just a matter of focusing your entire concentration on the task at hand and working on it. You'll automatically find that things start to work for you. Q. How do your administrators find using SysAid? A. Our administrators are extremely happy with SysAid, as they get all the information they need from the one place in the database. With SysAid, they never miss a call, which also means no angry users! Q. How do you think IT for the cosmetic industry is different? A. Being an FMCG company, we treat other industries the same. All industries have their own processes, but essentially, I believe the IT is all the same. Q. What will be the main IT challenges facing L'Oréal India in the coming years? A. L'Oréal India continues to grow at quite a rapid rate, so the biggest challenge in the years to come will be Asset Management, as the number of users and assets increases. SysAid 6.0's new features are going to be very helpful with this. Q. What have been the main organizational benefits of SysAid? A. Higher efficiency, lowered cost per call, plus we have earned a great reputation in the company. SysAid is also very cost-effective, which has resulted in further savings, especially since we do not have to maintain other asset management software. SysAid has made it much simpler to tag and locate our assets worldwide. It's such an important tool, that SysAid has not only been rolled out in our head office, but also across all L'Oréal India divisions, including regional offices and factories. Q. Do you use SysAid in any interesting/innovative ways? A. There are so many things that can be done with SysAid. We already use it quite heavily in our Project Management processes for example. Our favorite aspect is the Asset Management and Monitoring modules. Q. What were the main IT issues in your department prior to deploying SysAid? A. Our main challenges were tracking and monitoring assets, and measuring the time and resources spent on day-to-day calls. Prior to SysAid, a lot of calls were being missed when our administrators were away from their desks helping other users - which happened quite a bit without SysAid remote control! This made it extremely difficult to communicate and follow-up urgent escalations. We also had problems monitoring servers and critical users. Q. How has SysAid helped you to overcome them? A. With both Asset Management and Helpdesk functions. We are now able to track our day-to-day activities with greater accuracy and ease. SysAid's server monitoring also helps us keep a close eye on our critical users and assets, while the SysAid remote control is another great feature that has saved our administrators a lot of time. Q. On a lighter note, what are your hobbies? A. Playing and watching cricket - it's one of my all time favorite sports. A. ...problem and risk free, making the end user happy, and then being rewarded with smiles all over the end users face. Are you the next SysAider of the Month? Do IT with style! Get in the running today for the SysAider of the Month awards, for your chance to take home a hot new SysAid prize package. 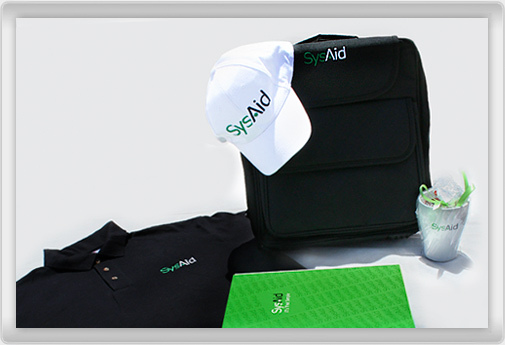 You'll be the slickest SysAider in town with our limited edition SysAid designer laptop bag, coffee mug, notebook, cap and T-Shirt as featured below. SysAid breathes new life into Customer Service Operations at Davanti Warehousing BV, after years of wrestling with outdated Service Desk software. We needed a new system which would help us to overcome these issues and enable us to provide our customers with the high standards of quality service they expected from us. We did some research and one of the options we came across was SysAid, which seemed to us to contain the features we were looking for, along with the ability to customize options and low TCO. It was also a stable and mature product which offered continuity (unlike our previous Service Desk application), which was very important. We also found by browsing around that SysAid has a highly active community, in which Ilient itself is very active and open to suggestions made by customers. While first inquiring about SysAid and its capabilities, we noticed quite early on that Ilient's Customer Service Helpdesk was both highly capable and quick to respond to issues and queries." "We first deployed the SysAid Helpdesk and reporting tool back in 2007, and it immediately provided us with all the features that we needed and more. It had room for standard customization, as well as individual customization options that we could apply to our Customer Service department. The ability to change SysAid's forms and views exactly the way that we wanted was highly convenient, as it helped us to integrate SysAid with our customer service web portal. We set up SysAid to allow our customers to easily submit Incidents, Changes and RFI's online, with part automatic and part manual notifications. Some of our customers also use the automatic reporting facility, which we are currently reinforcing to offer our customers a wider range of options via our external web portal. Best of all, we were finally able to implement escalation rules based on SR priority and due dates, as well as capture SR's for which no action had been taken for an extended period of time. We're also very impressed with the rate of new SysAid releases and the ease of upgrade we've experienced so far." "Our main organizational goals were to improve efficiency, limit the amount of manual activity required, and enhance customer satisfaction. Since the implementation of SysAid, we have received commendations about our notable service improvements, and we certainly feel that we have taken big leaps in achieving these goals over the last year and a half. As operations continue to expand, our Customer Service department is still undergoing a few changes, so we are constantly making adjustments and improvements to the system. The best thing about SysAid is that it is able to change with us, and continues to remain highly responsive to our evolving needs." Davanti Warehousing BV, based in the Netherlands, specializes in warehouse logistics and offers a suite of software solutions, including the MLS warehouse management system. MLS has a solid European customer base across logistic service providers, retailers, wholesalers and manufacturers in Benelux, Poland, France, UK, Ireland, Ukraine and Iceland. Do you have a SysAid IT Success Story? Who knows, you could be reading about your organization next month! We'd love to hear about your achievements, no matter how big or small. Contact us at Marketing Communications. Last chance to deck your halls with SysAid! We've found a way to let your end users and staff know that simplicity and ease-of-use are our SysAid trademarks. Earlier this year we produced a collection of eight beautiful SysAid posters for the SysAid Internal Campaign. Many have used them not only to decorate their offices, but also to remind users that in dire need, hitting F11 is all it takes to save the day. You'll have to be quick, as there are only a few left from each design! Write to us at Marketing Communications with your contact details and postal address. 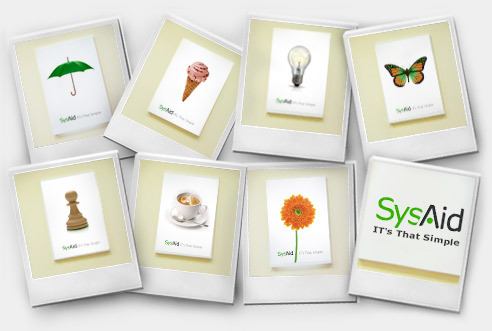 Let us know in a few words what your internal promotion plans are, and why the SysAid posters are for you. SysAid poster packs will be sent to all successful applicants. Who isn't familiar with the magical undo button that simply undoes your last action? We all use it, and the ones who encounter it for the first time usually say "WOW!!". Using the keyboard shortcut CTRL Z performs the same Undo action - instead of using the mouse to search for and click the small icon. This will afford you a second or two in time savings. By the way, CTRL Y performs the Redo function. Find out more in this useful Knowledgebase post. Don't forget, you can integrate this and other Knowledgebase posts directly into your local SysAid. If you have a handy hint, share it with us and help build a comprehensive IT Helpdesk Knowledgebase open to all IT professionals worldwide. This May, I'd like to raise the topic of due dates. While we're all familiar with them (and the pressures they can sometimes bring! ), it helps to also remember that due dates keep us in focus and help us to stay on track, especially when it comes to meeting service level and quality commitments. Imagine being able to access an instant snapshot of your department's workload, and keep an eye on your overall service levels with just one glance. Well, with Release 6.0, you don't have to imagine anymore. Before, SysAid enabled you to define due dates manually for each SR received, or set pre-defined rules under Preferences -> Helpdesk Settings -> Due Date. In Release 6.0, we introduced an exciting new feature: Gantt Chart display by Due Date. The new Gantt Chart display enables you to assess exactly where you stand in relation to your day-to-day work, as well as access a vivid, up-to-date graph of your staff's workload. That way, you can prioritize your department's workload to guarantee your service level commitments, without compromising your service quality. 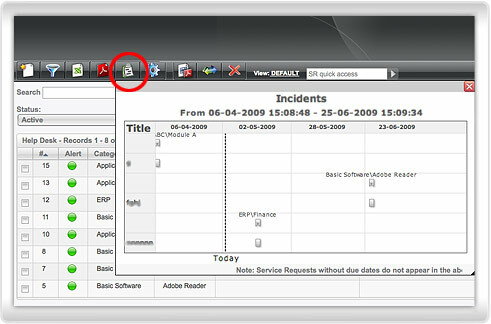 You can access the chart by clicking the icon circled below, located at the top of your Helpdesk list. This has been a great help for me, and I hope you'll find it just as useful! How do you integrate SysAid with Gmail? "Hi, I found a solution to integrate SysAid with gmail.com. Gmail requires the use of SSL for email, and this is not supported by SysAid. Using Stunnel it is possible to do this. and I can send and receive mails to and from a gmail.com account. The stunnel configuration is..."
Find out more in this month's Hottest Community post. Remember, the SysAid Community is the place to be for this and other handy hints. We're here to help each other, so if you have a question or useful tip, why not share it with the SysAid Community and other IT Professionals around the world? SysAid Poll of the Month: Do You Tweet? Ashton, CNN, Oprah... the celebrity list keeps growing and the numbers piling high. With 19.1 million worldwide visitors last March alone, it's been hailed the internet's 'next big thing'. But is it? We'd like to hear from you. Do you use twitter? If so, for personal or business use? What are its main advantages and drawbacks? Perhaps you've chosen to steer clear entirely of the latest web 2.0 'fad' sweeping the headlines today? Take our super-quick poll and share your experiences with us. What's your tech innovation style? It's official - SysAiders lead the pack when it comes to new technology! According to studies by Everett Rogers, 2.5% of people are likely to fit the 'Innovator' bill. We blew that proportion sky-high in the SysAid Community last month. 52% of SysAiders are likely to leap into the technological unknown, while a staggering 83% of SysAiders tend to adopt new tech innovations ahead of the majority.